Open pores on face can be a matter of concern for the beauty-conscious people as these pores severely affect the looks and confidence of a person. You can have open pores on nose and cheek. 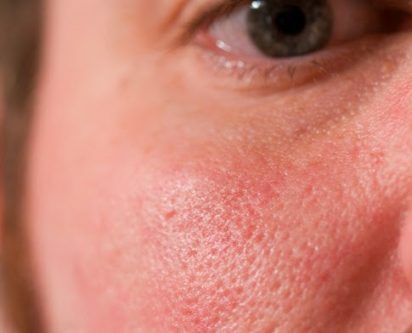 Bacteria, dirt, oily skin, stress, poor skin care, excess sebum, sun exposure are some of the causes for open your pores. The open pores can be worsened with increasing age as your skin tends to lose elasticity at that phase. You can apply home remedies for open pores. Are you looking for some natural remedies to close open pores? If yes, then consider the following six ways to get rid of open pores. These remedies are effective, natural, and inexpensive. Ice has skin tightening effect that can help to shrink the large pores. It is usually used for the healthier skin. Take a few ice cubes and wrap them in a clean cloth and hold that cloth on your open pores for about fifteen seconds. Practice this treatment two to three times daily. You can simply wash face with the cold water as well. You can make it more effective by adding apple juice, rose water, and green tea in the water while making the cubes. Egg whites tighten and tone the skin and it is also useful to shrink the enlarged pores. It is used to remove dirt and excess oil from the skin. For the open pore, simply collect the egg whites and apply it directly on your face. Let it dry completely. Now you can clean it with normal water and pat it dry. Follow this practice two times in a week. You can also mix egg white with lemon juice. Apply this pack on your face and allow it to dry completely. Now clean the pack with water. Follow this practice two to three times in a week. Apple cider vinegar is used as a natural skin toner. It reduces the open pores, tightens the skins, and also helpful in restoring the skin’s pH balance. Take an equal amount of the apple cider vinegar and water, and mix it properly. Then soak a cotton ball in that solution and apply that ball on the open pores. Leave it as it is for ten minutes. Then you can clean it with water. You can follow this treatment every night after removing the makeup and cleaning. It can be followed by a moisturizer. Lemon juice contains citric acid that reduces the large open pores. It is also effective to improve your skin complexion. To treat the open pores, take one teaspoon of organic honey and the juice of one lemon. Now apply this mixture on your face. You can leave it for fifteen minutes. Then clean your face with water. Follow this practice daily. You can also prepare a mixture of the equal amount of the lemon juice and tomato juice. Apply it on your face. Allow it to dry completely. Follow this practice four to five times in every week. Yogurt has lactic acid that helps to eliminate the excess dirt, oil, and dead skins that will ultimately reduce the appearance of the large open pores. For the treatment, apply a thin layer of yogurt on your face. Keep it for ten to fifteen minutes. You can practice this procedure on a daily basis. You can make a paste of gram flour and yogurt as well. And apply this solution on your face. Leave it for ten minutes and then clean that solution with water. Follow this practice two times in every week. Cucumber is very effective for the large open pores. It can improve your skin texture and can make it glowing. Take the extracts of a fresh cucumber, soak a cotton ball into it and apply the extracts directly on your face. Allow it to dry completely. After drying up, clean the affected area with cold water. You can make a mixture of lemon juice, rose water, and cucumber juice. Apply this mixture on your face. Leave it for fifteen minutes before cleaning with cold water. You can follow this treatment on a daily basis. Avoid the skin care products that clog pores. Wash your face with jojoba oil. Use sugar scrubs for your face.